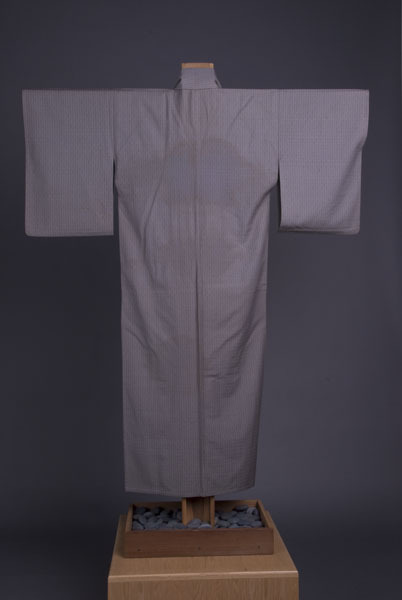 1 kimono : wool, cotton ; 57 x 24 (center back) in., sleeves 21 x 12.5 in. Gray wool (mosu) kimono with black pinstripes that are composed of long line and dot pattern (----.-----.-----.-----). Collar (4.25 in. wide) is lined with lavender cotton. Center back panel is lined in gray cotton. Back shoulder area is lined in gray cotton fabric on the proper right side and in natural color cotton fabric on proper left side. Yellowing/light brown perspiration stains on lining. 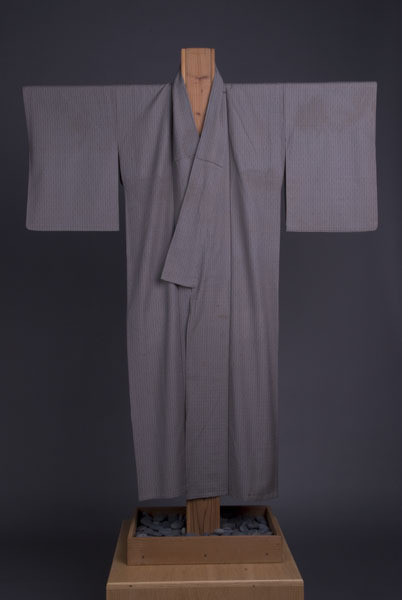 Handsewn dressy kimono worn for parties (not weddings) or going to town from 1912 to 1938. Subdued colors worn by widows.